When life gives lemons you have two choices: 1) make lemonade or 2) grab the salt & tequila. 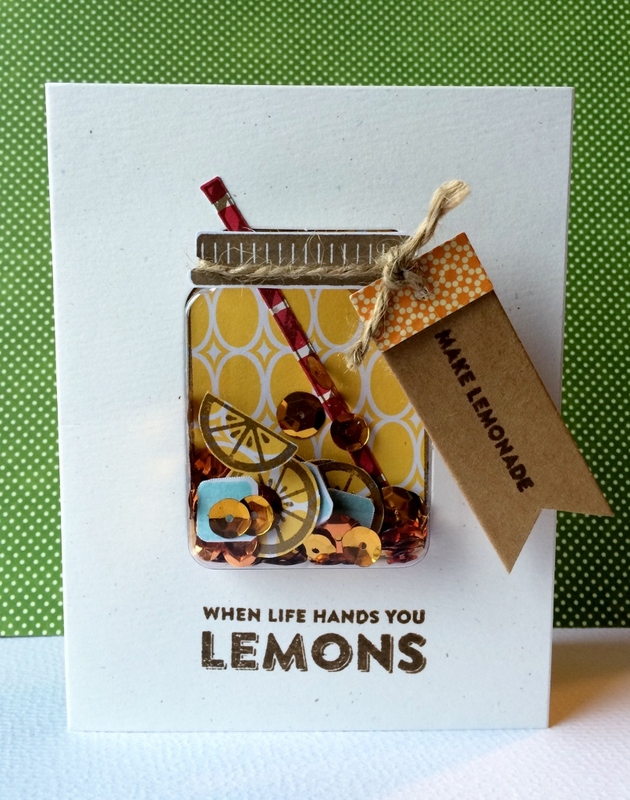 I chose to make a lemonade card with this new shaker set from Hampton Art and Jillibean Soup. Beginning with the jar card base I stamped the sentiment in the bottom center in brown ink. 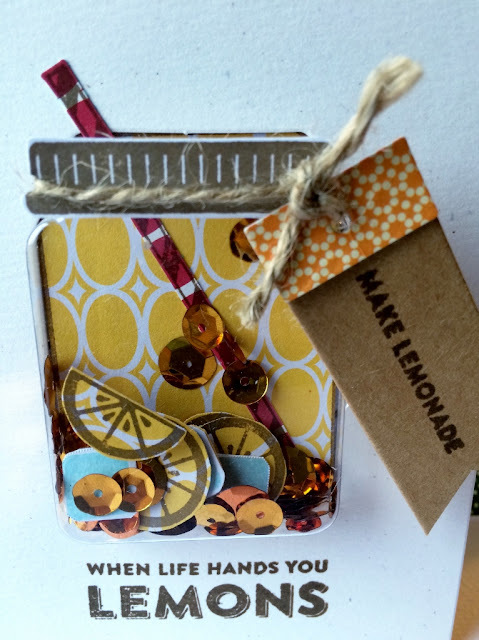 Then I grabbed one of the new Jillibean Soup Banner tags and stamped the “make lemonade” in brown ink too. Then in brown ink onto white cardstock I stamped the jar lid and onto the yellow patterned paper I stamped the jar. After that I needed some lemons, they were stamped in brown ink too onto the yellow patterned paper. Then I needed to stamp the straw onto red patterned paper, both paper from Sew Sweet Sunshine Soup. Then I needed some light blue ink to stamp the ice cubes onto white cardstock. Next I cut out all the lemon slices, ice cubes, straw and lid. Choosing yellow and orange sequins from the sequin pack I added those in with the lemon slices and ice cubes into the shaker jar shape. I cut out the jar backer and adhered the straw, cutting the top off and adding to the front of the card. Then I removed adhesive strip and added shaker shape onto card with a backer. Last I adhered the jar lid to the top of jar shaker shape with a twine wrapped around it and then added on the kraft banner tag with a 3D Foam dot. Love how it turned out, so fun! May all your lemons turn into lemonade this winter season.